We’re thrilled to offer fencing classes to the community of Sugar Land, Texas. Salle Mauro offers fencing classes to almost everyone. We offer both private and group setting classes. Call to register your family. We have beginner classes, intermediate, advanced and more. If you are looking for a fencing class that will help hone in your skills then please contact us. 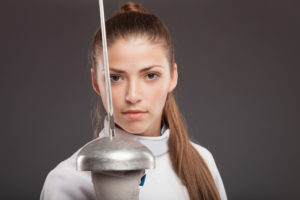 When school is out we offer fencing camp so that you can focus more on your lessons. If you love sparing, then you should register for our classes. Our instructors are very friendly and are always ready to help you with your next lesson. Did you know that we offer private birthday party celebrations? We provide a 2-hour private party session for groups of 20 or more. It includes a game of sparing, fencing and more. We offer fencing classes to Fort Bend County and most of the Houston area. Sugar Land is only 19 miles away from downtown Houston, Texas. This community is known for the large sugar plantations that use to be here back in the early 1900s. George Ranch Historical Park – this working ranch allows visitors to come to see the history of the town. Cullinan Park – You can bird watch from the dock on the water or enjoy a walk around the lakes. You can find out more about our community by visiting the city page or the Chamber of Commerce site. The team at Salle Mauro wants to get you registered for fencing today. We have lots of information to share about all of our programs. Please contact us to book an appointment today.